The term pressure relief valve or PRV is self explanatory, in a general sense. A PRV is needed in any system, including compressed air, where there is the potential for pressure to increase to an unsafe level in a pressure vessel. Pressure systems may have a number of PRV’s installed to provide redundancy in safety measure. Essentially, a PRV should be installed anywhere there may be a need to relieve pressure for any reason, for example, the hot water tank in your home has a PRV. It is set up so that if the pressure inside the water tank gets too high, the PRV will open and vent a stream of hot water and steam.. This usually means all over your floor, of course. Nevertheless, the PRV in the hot water tank will ensure that the tank cannot over-pressurize – a critical safety feature. Air compressors are supplied equipped with a pressure relief valve on the tank or between cylinders in mutli-cylinder air compressor models. Always be sure that the receiver, air tank or reservoir into which any compressor pumps air, has a working PRV. Please see the video below. When your air system calls for air, your compressor cuts in. The compressor pump gulps in free air through an intake filter and scrunches that air into the compressor tank. It continues this process until the pressure inside the tank reaches the cut out pressure level. At this time, your compressor should stop. If The Compressor Does Not Stop? 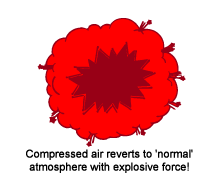 Compressed air is explosive when it is released suddenly. Being around if a compressed air tank should disintegrate due to unsafe high pressure levels inside would be unhealthy, with the tank opening up like a bomb! To help ensure that this does not happen the compressed air receiver has a PRV installed that has access to the air pressure inside the tank. The PRV might be part of the check valve, pressure switch and PRV assembly, where the air line from the compressor head enters the air tank. Many compressor PRV ‘s look a bit like this. 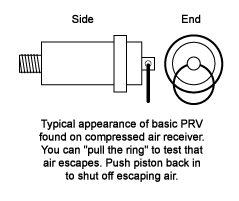 There is a ring on the end of the PRV which, when pulled, will activate the PRV and allow air from the receiver to vent to atmosphere. Some PRV’s rely on “sticktion”; the friction between its parts, to generate enough internal resistance to keep the PRV from cracking open to vent air. Other PRV’s have an internal spring performing the same task. In both cases when the pressure inside the tank reaches the PRV set point, the air pressure acting on the piston inside the PRV overcomes the “sticktion” or the spring pressure, forcing the piston out, and opening the flow path from the air tank to atmosphere, venting over pressure. Check the PRV regularly. Give the ring a pull to make sure it releases easily and air flow. Push the ring and piston back in and pull it out a couple of times, then push back in when test PRV test is complete. I prefer wearing gloves and air defenders when I do this. While I have never had a PRV on a receiver open due to over-pressure inside the tank, having the PRV there provides a critical and mandatory additional line of defense against over-pressurization. The PRV is a cheap insurance. Having a working PRV in an air circuit backs up the pressure switch and, in extreme cases, will prevent a catastrophic over pressure and failure of a compressor tank. Every new PRV I have installed on my air compressor leaks air. I have a central pneumatic 6 gallon 150 psi air compressor.